I'm calling it right now. Chloe and Lucifer will not kiss. Somehow they are going to be interrupted, probably by Maze or Dan, and the moment many have been waiting for will have to be shelved a little longer. But, that almost kiss isn't the real brouhaha of Lucifer Season 2 Episode 10. We finally found out why Chloe is so special. She's a miracle baby. Apparently, the one and only time God ever sent Amenadiel to earth to bless a childless couple, and it happened to be Chloe's parents. I'm not sure if I heard right, but did Amenadiel say that God arranged this for Lucifer's sake? As in, God knew all this was going to happen? That Lucifer was going to abandon Hell? That he would meet and fall in love with Chloe? So what does this mean exactly? Is this "plan" God's way of saying I'm sorry for casting Lucifer to hell? Why does he want this union? 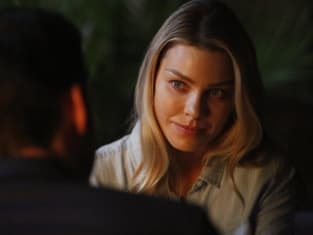 What is the significance of a Chloe and Lucifer connection? There are so many question I need answered!!!!! I'm about done with the whole Charlotte angle. I'm having a hard time staying invested in her story. And I really don't see what they could possibly do to Chloe that would help Amenadiel get his wings back. I wish he would get his wings back, because then he and Charlotte could go away. Or, Amenadiel could just take Charlotte back and then come back and be with Maze. That would be nice. The trial for the guy who murdered Chloe's dad came out of left field. Chloe would not have kept quiet about something that important for the last however many episodes. She would be fretting about it. She would be talking to Dan about it. And, she probably would be talking to Lucifer about it. It's not something that would have just happened. It's too important of a story, but Lucifer handled it the same way they handled the initial investigation. It was just thrown at us. Despite that, the hour was still a lot of fun. As usual. Was anyone else unsurprised at Lucifer being able to charm the Court, the jurors, and everyone else? He knew the judge's first name; and how fun was it that he took a juror's scarf and did a complete reenactment of the bathhouse scene? Yes, it was absolutely ludicrous, but that made it all the more fun! I'm not sure I liked Charlotte as the defendant's lawyer. It seemed forced to me. And, she didn't even know what she was doing. For such a high profile case, wouldn't she have been prepped? At least a little? She got her act together pretty quick, and I like that she offered Chloe a chance to put her father's killer in jail. It was the perfect opportunity for Chloe to get justice for her dad's murder, but she couldn't betray Lucifer. While her entire speech was kind of cheesy, it still made my heart explode! Did you see Lucifer's face? It's obvious they are meant to be together. Even though the guy (I forget his name) didn't go to jail for the murder, he still got his just due. As it turned out, Dan took a walk on a darker side when he teamed up with Maze to take care of the guy. I love that they worked together on that one. But the absolute best part of the hour had to be when Maze took on that Chinese guy. As if he ever had a chance. The cast always looks like they're having so much fun shooting scenes, and that scene looked like a blast. Linda was really great this hour, too. I loved that she was rooting for Clucifer. She genuinely seemed disappointed that Lucifer didn't follow through with the "date." How excited will she be when she finds out they almost kissed? Other than Charlotte, and possibly Amenadiel, I don't think there's anyone on this show who isn't rooting for Clucifer. I think Maze might actually be a fan of it as well. And, can you imagine what Trixie will think when and if she finds out? Lucifer is going to get the biggest hug ever! Still, Chloe being just a miracle baby seems too simple of an answer. There has to be something more, right? One last thing. I know I've mentioned this before, but Ella is really growing on me. I loved every minute of her interaction with Dan. She fits in so perfectly now, and I like that they moved her out of that office she was stuck in before...when I hated her. She's spread her wings and the show is better for it! What did you think of "Quid Pro Ho"? Are you satisfied with the reveal? Hit the comments and share your thoughts. If you missed anything, you can watch Lucifer online right here via TV Fanatic. Lucifer Photos from "Quid Pro Ho"
You are lying, Lucifer. To yourself. Permalink: You are lying, Lucifer. To yourself. Amenadiel: You can't kill her, mom. Charlotte: Of course I can. I just push the button. Permalink: Of course I can. I just push the button.